Today’s digital economy spans geographies, network landscapes, and distributed datacenters, so it is important to establish seamless remote connectivity for end users, wherever they connect and from whichever device. eG Innovations, a Citrix Ready Partner since 2010, and Citrix have been working together to ensure that their end-user computing solutions offer an enriching virtual workspace experience for users. To help organizations monitor, manage and improve end-user experience for virtualized application/desktop delivery, eG Innovations has released a free tool, the eG Enterprise Express Logon Simulator – a fully SaaS-based synthetic logon testing and performance monitoring tool for Citrix infrastructures. It is compatible with Citrix XenApp and XenDesktop. Read more about this tool here. Quick Deployment. Easy to Get Started. From here, the eG Enterprise Express Logon Simulator will automatically start performing logon simulations and capturing performance metrics. Administrators can use a web-based dashboard to monitor logon simulations. The eG Enterprise Express Logon Simulator is a completely free service offered by eG Innovations. Any organization using Citrix technologies can benefit from this free tool, as it helps them proactively monitor, test and optimize the XenApp and XenDesktop user experience. Also, Citrix Solution Advisors that offer Citrix services can make use of eG Enterprise Express themselves or recommend it to their customers. The free logon simulator is especially useful during new Citrix deployments, upgrades, and infrastructure expansion. By benchmarking performance before and after an upgrade/expansion, Citrix administrators can precisely measure any change in user experience throughout the upgrade/expansion process. 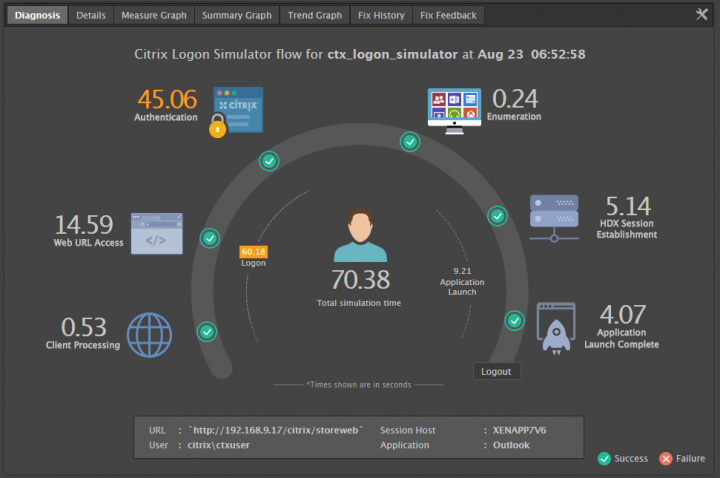 The eG Enterprise Express Free Logon Simulator complements Citrix Director’s real user experience monitoring capabilities for XenApp and XenDesktop sessions. Using both real user logon monitoring and synthetic logon monitoring technologies helps Citrix administrators take better control of managing the Citrix user experience, and their organizations can benefit from improved business productivity and customer satisfaction.